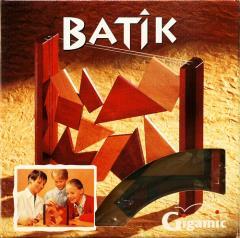 A combination of Tetris and Bausack in which each player has a set of wooden pieces in various shapes. The playing area is formed from two sheets of parallel Plexiglas. Players take turns dropping pieces into the gap until a piece cannot be wholly inserted. The owner of that piece loses the round, and forfeits the offending piece. A new round begins, with the winner of the previous round playing first. Play continues until one player has no pieces when it is their turn to move; they lose the game.